A fox runs into the road and forces the driver coming towards it to swerve and almost crash. Is it the fox’s fault if the person dies, or does it matter if the driver runs the fox over to save themselves? Which life is worth more? And if you grow up in South London should you be punished for carrying a knife to protect yourself? Or if you stab someone as self-defense is it still a crime? This complex and delicate issue is handled beautifully in David Alade’s Fox Hunting. Throughout this piece, five young men share their experience of growing up in London’s South, and each has his own unique experience of what innocence means. Comparing themselves to foxes that are hunted for sport, these men share tales of love, violence and fear and what it means to protect not only their lives on a daily basis, but their reputations as well. This ensemble piece is told through a series of monologues and gives detailed accounts of knife crime in these London streets. They questions their belief in God, their safety in their own town and are challenged regarding their race and postcode. While some of the monologues feel a little long in places, each story is completely unique and each actor had made clear and important choices. The cast excel at transforming into different characters that support each other within the stories, and the sense of camaraderie amongst the boys feels sincere, adding to the tenderness of the piece. It also breaks through many of the stereotypes of young people growing up in these communities. One of the most memorable moments include when the ensemble embody the music played inside one of the boys headphones, rapping and singing in harmony with each other and filling the space with dazzling sound. 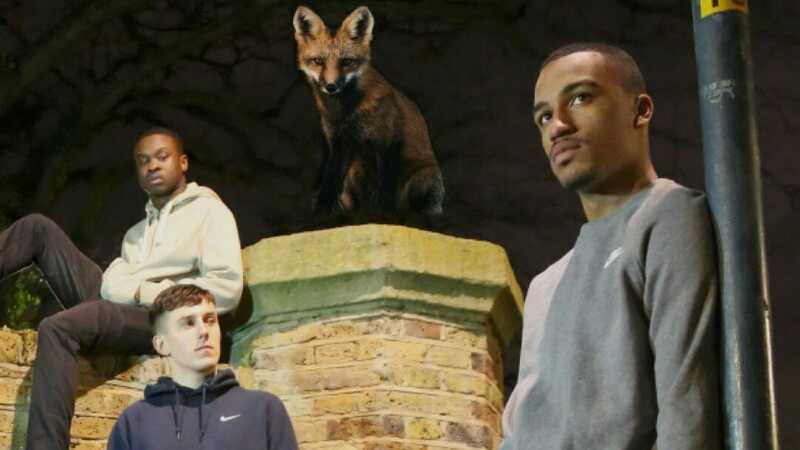 With a surprising and heartbreaking ending that feels completely fitting, this show is brutally honest, laugh-out-loud funny and sends a strong message about the grim realities that have become normality for many young Londoners. It demonstrates the importance of theatre in bringing to light stories that are often overlooked, and reminds us how close to home some of these issues hit. Fox Hunting runs through 19 May.